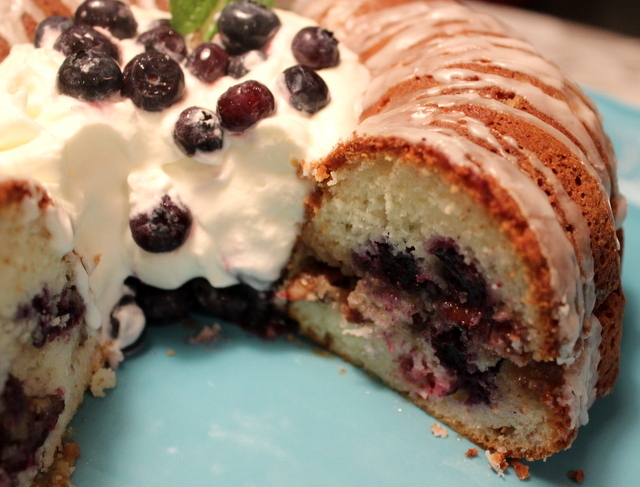 Debbie’s Blueberry Coffee Cake is the cake that my daughter’s new mother-in-law made for the wedding. Debbie is the mother of my daughter’s new husband and turns out she is a great cook. As you all may have known, my daughter got married a couple of months ago in Orlando and we all stayed in a house we rented from Reunion Resort. Here are some pictures from the wedding. There were a total of 21 people staying in the house and we had to make a lot of food. We also made all the food for the wedding day. At the wedding Debbie was a tremendous help to me and she made this scrumptious blueberry coffee cake for one of the wedding breakfasts. You can make this cake in a number of ways. Debbie used a rectangular baking pan. 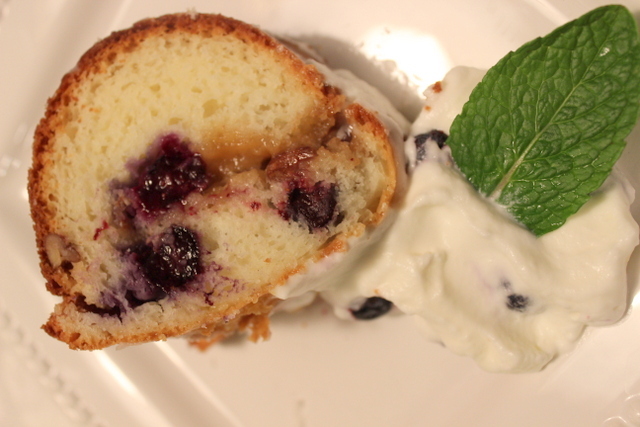 When I recreated this recipe I decided to use a bundt cake pan. I followed the same procedure she used but the pan was different. Next time I will use the rectangular baking pan and see if that makes a difference. Everyone loved her cake. I changed the cake slightly and used a sugar glaze on the cake but her version was for a butter cream frosting. I think the butter cream frosting is a better choice so I included a recipe for butter cream frosting here. 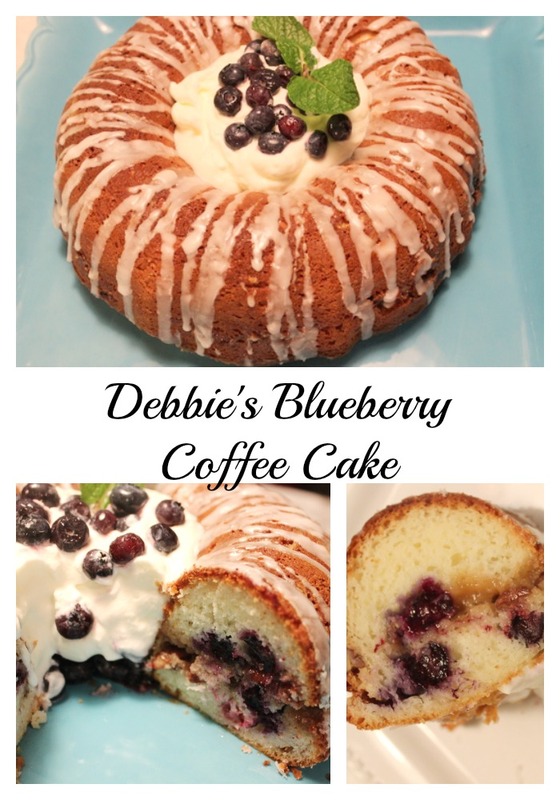 DEBBIE’S BLUEBERRY COFFEE CAKE WAS YUMMY! Looking at the inside of Debbie’s Blueberry Coffee Cake, you can see the two layers and the blueberries, brown sugar, butter and the nuts in the middle. In the cake batter sour cream was added and I think it makes the cake very moist. Don’t these pictures make you want to have a piece of this cake right now? It’s one of those cakes that you could eat anytime and not just for breakfast. 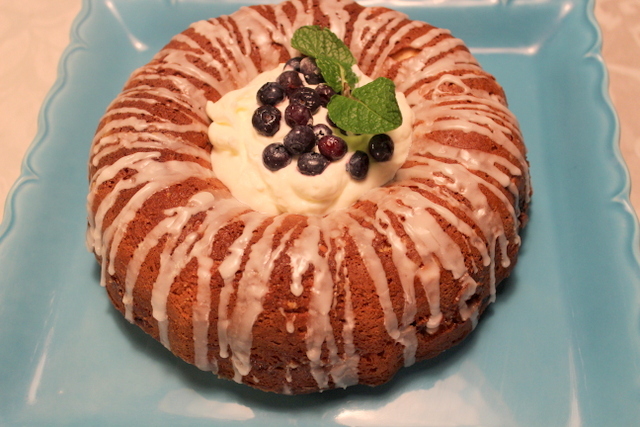 Blueberries, brown sugar, nuts and sour cream make this cake Blueberry Coffee cake special. Cut butter into 1/3 cup of the dry cake mix and mix until crumbly. Mix in brown sugar and nuts and set aside. Beat eggs slightly with a fork and stir in sur cream. Mix in remaining cake mix (batter will be lumpy). Spread 1/2 batter in cake pan, sprinkle on brown sugar mixture, spread remaining batter on top. Bake Cake for 45-50 minutes. Remove from pan and drizzle with butter cream frosting. For the Butter Cream Frosting, beat your butter for a few minutes. Add the confectionary sugar and beat on low speed until incorporated. Add salt, vanilla, and cream or milk and beat on high until fluffy. Add enough milk to make the frosting creamy or more if you want to drizzle it on the baked cake. This is one amazing looking cake, I can tell from the pictures how moist and delicious it is! Thanks Sara. 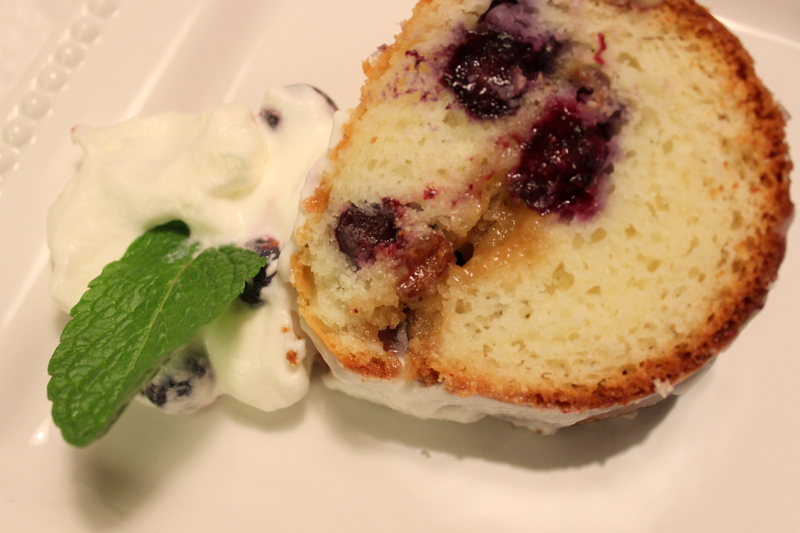 The blueberries and sour cream make it very moist! This cake looks deliciously gorgeous! Thanks Marye. It is a pretty delicious recipe! I'll tell Debbie you liked it. She will love to hear that. It was a pretty cake! My husband loves coffee cake before he goes to work in the morning! This is a great recipe for him! You'll have to make it for him. He will love it Sabrina! This is one stunning looking cake, I can tell from the photos how damp and delightful it is!